whose small businesses are making best use of the web to attract customers and grow revenue. Today we crowned North Sydney as the region whose web-savvy small businesses are outpacing the others. At an event at North Sydney business FORM+DESIGN, we were joined by Treasurer Joe Hockey and North Sydney Council representative Martin Ellis to hear about the innovative things North Sydney businesses are doing to lead the pack and stand out from one of the world’s biggest CBD’s right on their doorstep. For example, 20 years ago FORM+DESIGN’s customers were limited to the fifty thousand residents who lived close enough to walk into their store. Now, using online marketing to reach people who are looking for homewares, their customers come from as far afield as Melbourne, Perth, New Caledonia, Germany and Sweden. Something we were particularly excited to share on during the day is that in 2014 Google is committed to training more that 2,000 people to become web experts; experts that can then reach approximately 250,000 small businesses to help them become web enabled and take their revenue to the next level. From Holdfast Bay in South Australia to Launceston in Tasmania, small businesses across the country are growing their business with online marketing and social media—with good reason. Simply put, the web is rocket fuel to small business. Research shows that those that make the most of the online tools are two times more likely to be growing revenue, and four times more likely to be hiring. Inspired by the example of North Sydney and FORM+DESIGN, we hope to see many more regions and small businesses across Australia realise the potential of the web to grow their business, create jobs, and contribute to Australia’s economy. Small businesses employ over five million people or almost half of Australia’s jobs, and generate a third of our economic activity, so the growth that the web can bring to these businesses is a big deal. Small businesses who are yet to take the web plunge can take the first step on their online journey by setting up their own free Google+ page to help connect with customers on Google Search, Maps, and Google+. Earlier this year we announced the eTowns across Australia whose small businesses are making best use of the web to attract customers and grow revenue. Today we crowned North Sydney as the region whose web-savvy small businesses are outpacing the others. At an event at North Sydney business FORM+DESIGN, we were joined by Treasurer Joe Hockey and North Sydney Council representative Martin Ellis to hear about the innovative things North Sydney businesses are doing to lead the pack and stand out from one of the world’s biggest CBD’s right on their doorstep. For example, 20 years ago FORM+DESIGN’s customers were limited to the fifty thousand residents who lived close enough to walk into their store. Now, using online marketing to reach people who are looking for homewares, their customers come from as far afield as Melbourne, Perth, New Caledonia, Germany and Sweden. Something we were particularly excited to share on during the day is that in 2014 Google is committed to training more that 2,000 people to become web experts; experts that can then reach approximately 250,000 small businesses to help them become web enabled and take their revenue to the next level. From Holdfast Bay in South Australia to Launceston in Tasmania, small businesses across the country are growing their business with online marketing and social media—with good reason. Simply put, the web is rocket fuel to small business. Research shows that those that make the most of the online tools are two times more likely to be growing revenue, and four times more likely to be hiring. Inspired by the example of North Sydney and FORM+DESIGN, we hope to see many more regions and small businesses across Australia realise the potential of the web to grow their business, create jobs, and contribute to Australia’s economy. Small businesses employ over five million people or almost half of Australia’s jobs, and generate a third of our economic activity, so the growth that the web can bring to these businesses is a big deal. Small businesses who are yet to take the web plunge can take the first step on their online journey by setting up their own free Google+ page to help connect with customers on Google Search, Maps, and Google+. 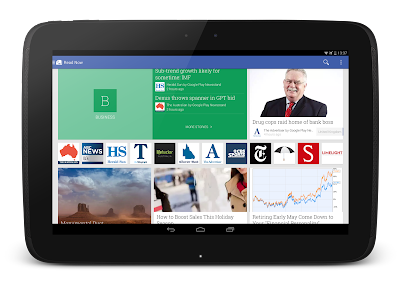 Today we’re launching Google Play Newsstand, a new app for your Android phone or tablet which brings together all of your favorite news sources in one experience. Newsstand puts the news you care about most front and centre and presents stories that interest you based on your tastes. The more you read the better it will get. You can subscribe to magazines, newspapers, blogs and news sites and we’ll format and optimise them all for reading on your tablet or phone. With the swipe of a finger, you can browse full length articles, with beautiful images, audio and video right inside the app. You can access these articles even when you’re offline or bookmark them to read later. News sites - Leading news sites like ABC News, The Atlantic, CBS Sports, CNET, The Daily Beast, Mumbrella, The Guardian, NPR, Reuters, The Telegraph, Lifehacker, The Shout, and more. The Google Play Magazines app will be upgraded to Google Play Newsstand over the next few days, or if you don’t have the app, you can download it for your Android phone or tablet from Google Play. 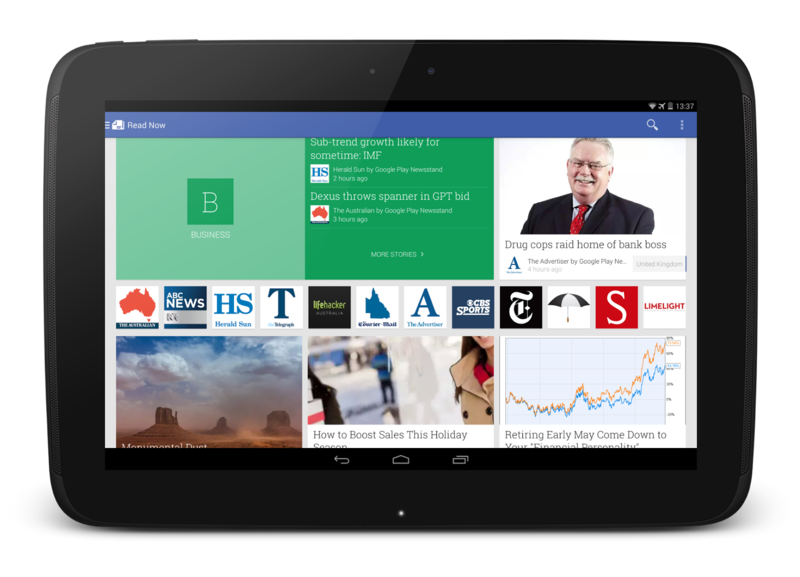 If you’re a Google Currents user, you can upgrade to Play Newsstand by downloading the new app. You’ll find all of your favorite news sources will be transferred and ready to read the minute you open it. Staying up on the news can be a daunting task. You have to go to a different website or app for each of your favourite magazines, newspapers and blogs. One place to read and discover all of this would be a lot simpler. launch of Chromebooks in Australia earlier this year, many Aussies have discovered an easier, faster and more secure way of computing. Chromebooks are a new type of computer from Google that boot up in seconds, automatically stay up-to-date and are hassle-free. There’s no need to worry about security updates, nagging anti-virus updates or malware either— Chromebooks just work. Now Aussies have more Chromebook to choose from with the release of the Acer C720 Chromebook and the HP Chromebook 14. Light and portable, the Acer C720 Chromebook slips easily into a bag or purse and has up to 8.5 hours of battery power to last you the whole day. The HP Chromebook 14 has a brilliant 14’’ screen, which is perfect for watching YouTube clips, or video chatting with friends. Both devices have Intel’s latest processors, which use less power so have a great battery life, giving you more time to focus on getting things done rather than looking for a charger. The Acer C720 Chromebook and the HP Chromebook 14 come with 100GB of free Google Drive* storage, so you can safely store all your stuff on the web and Google will also provide a 60 day trial of Google Play Music All Access. ** The Acer C720 Chromebook (RRP $399) will be available from select JB Hi-Fi stores nationally and the HP Chromebook 14 (RRP $499) will be available from select JB Hi-Fi and Harvey Norman stores nationally this week. *100GB of free storage is for 2 years, starting on the date you redeem the Drive offer. **If you’ve ever tried a free trial for All Access, you are not eligible for the offer. Your 60-day trial will automatically switch to monthly billing unless you cancel. This offer is valid till the end of 2013. Since the launch of Chromebooks in Australia earlier this year, many Aussies have discovered an easier, faster and more secure way of computing. Chromebooks are a new type of computer from Google that boot up in seconds, automatically stay up-to-date and are hassle-free. There’s no need to worry about security updates, nagging anti-virus updates or malware either— Chromebooks just work. With the summer holidays fast approaching and new devices rolling out, we thought it would be a good time to remind parents about some easy ways we can keep kids keep safe online. Protecting our users is one of our top priorities at Google and when it comes to family safety, we give parents and teachers with tools to help them choose what content their children see online. 1. SafeSearch in Google Search. Want to hide explicit images, search results, and videos? Turn on SafeSearch, a filter that keeps many of the adult results you might not want popping up on the family computer out of your Google Search results. While no filter is 100% perfect, with SafeSearch on you can feel more confident browsing the web with your family. You can also lock SafeSearch on your computer by logging into your Google account and changing your settings. 2. YouTube SafetyMode. Turning on SafetyMode in YouTube is easy. Just scroll down to the bottom of any YouTube page and click on the button that says “Safety” at the bottom of the page switch it on. You can also log in with a YouTube account and lock SafetyMode as your default setting on each one of your computer browsers. It will filter out videos with mature content or that have been age-restricted, so they will not show up in video search, related videos, playlists, shows or films. Learn how to turn on and lock Safety Mode on YouTube. 3. Flags on YouTube. On every single video on YouTube, there is a flag that you can use to report a video if you don’t think it is appropriate and violates YouTube’s Community guidelines, including content that is violent, sexual or hateful. Flagged videos and channels are reviewed by YouTube staff 24 hours a day, seven days a week to determine whether they violate our Community Guidelines. Flagged videos that violate our guidelines are removed from YouTube. Check out more tips at the YouTube Safety Hub. 4. Google+ settings and safety notifications for teens. You might not want to share the same photos with your boss as you would with your family. And you might not want your teen to have all the same ways to share that you do. Google+ is built to share selectively like you would want to in real life. Google+ is customised for teens helps them take advantage of the flexibility Google+ offers with the right starting points, educational materials, and timely reminders. When a teen joins Google+ they have different default settings to help keep them safe and remind them to be responsible. Check out some examples. 5. Check out our Good to Know site. The site is our one-stop shop for information about the web and advice about how to keep yourself and your family safe and secure online. You can learn more about Google’s privacy and safety tools for families, get tips from parents at Google about family safety, and find out more what Google does to protect you, your family, and the Internet. We hope these tips will help make your summer holidays a little bit more relaxing. For more tips and videos about keeping your family safe online, visit our Family Safety Centre. It can be hard to keep up with all the latest devices and apps out there. I know in my house, my tech savvy kids are increasingly becoming our at home personal tech support. The web has become an incredible resource for our children, but it is important that we all make sure they are using it in a smart way. Today we want to recognise five STEM and computer science educators who are making an outstanding contribution to teaching in Australia. Each of them will receive LEGO Education EV3 Robotic kits and a special school visit early next year from a team of Google engineers who will talk to their classrooms about cool careers in technology. Linda’s class has partnered with Polperro Dolphin Swims to digitise eight years' worth of data about the dolphins in Port Phillip Bay that has just been sitting on a shelf. It's real computational science that will make a difference to the world. Jenny uses her engineering background to integrate ‘bee bots’ and other unique educational tools into her lesson plans to help introduce her students to computational thinking before they even realise it. Graeme has spent his career making sure that the stereotype of technology being a 'boys subject' does not take hold. He encourages students to investigate a range of technologies and devices in an environment that is challenging but fun, and equally available to both genders and all ages. Karin works to help teachers keep up with changes in technology and to integrate them into their curriculum before they become obsolete again. Rob has been using LEGO robotics to teach his students since 2001. He has also mentored teams in RoboCup Junior and the FIRST Robotics Competition, and teaches an online robotics class called SmartBots. Congratulations to these five teachers - we can’t wait to meet the brilliant young minds graduating from your classrooms - maybe when they apply for a job at Google one day? You can learn more about how you can build computer science and computational thinking into your curriculum, and inspire the next generation of innovators here. Last week, teachers from all over Australia came together at the first-ever Digital Curriculum Technologies Summit to discuss the best ways to bring computer science and computational thinking into Australian classrooms. Attendees at the summit were lucky enough to learn from some of the Aussie teachers who are leading the way in making computer science fun, approachable, and relevant to their daily lives. For example, the next time you’re planning a trip between the University of Tasmania and St David's Cathedral, you can simply type in the two locations to get information about which bus to catch. With the new version of Google Maps, you can also compare different public transport options to work out when you need to leave to arrive at your destination on time. Google Transit is also available on Google Maps for Android and iPhone. Simply search for where you want go and Google Maps will show you how to get there using public transport from your current location. We hope Google Transit in Tasmania will make it easier for you to plan your next journey and will help you to explore the island’s natural beauty and striking landscapes. Starting today, commuters in Tasmania can use Google Transit to make planning their journey around the city easier and faster. We’ve teamed up with Metro Tasmania to add information about bus stops, routes and timetables across Hobart, Launceston and Burnie on Google Maps. Congratulations to Olivia Kong of Hornsby Girls High School in NSW who has just been named the overall national winner for this year’s Doodle 4 Google competition. Olivia has won a Chromebook and Nexus 7 tablet for herself and $10,000 worth of technology for her school. Her doodle will be featured on the google.com.au homepage early next year. The National Age Group Winners spent yesterday at the National Gallery of Australia in Canberra for the unveiling of the National Winner. Ryan Yoon, Tara McIntyre, Jorga Attard and Olivia Kong were given a behind-the-scenes tour of the of the gallery and had a very special performance by renowned harpist Alice Giles who spoke about her own Antarctic explorations. The young doodlers also saw their work in a special digital display at the gallery. This year in a special prize sponsored by Commonwealth Bank of Australia, the winning schools teacher from Hornsby Girls High School, Nicole de Losa, will be going on an Antarctic expedition with Professor Chris Turney. You can see more about the expedition and meet some of the wildlife in the following Hangouts On Air series which will air live from the Antarctic islands. Special guests may include sea lions, penguins and the great albatross. Thank you to all our thousands of doodlers from across Australia, and look out for Olivia’s doodle on our homepage. Posted by Leticia Lentini, Event Marketing Manager, Google Australia, who is giddy with excitement at the prospect of seeing an albatross in the wild. In June we announced our latest Doodle 4 Google competition, in which we asked school students across Australia to draw their own version of the Google logo, inspired by the theme “If I was an explorer....” Now, over 16,000 doodles later, we can announce the winning doodle.